We’d love your help. 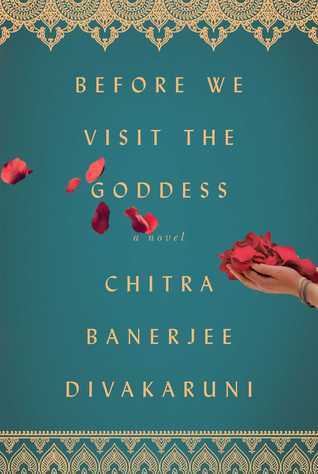 Let us know what’s wrong with this preview of Before We Visit the Goddess by Chitra Banerjee Divakaruni. The daughter of a poor baker in rural Bengal, I A beautiful, powerful new novel from the bestselling, award-winning author of Sister of My Heart and The Mistress of Spices about three generations of mothers and daughters who must discover their greatest source of strength in one another—a masterful, brilliant tale of a family both united and torn apart by ambition and love. To ask other readers questions about Before We Visit the Goddess, please sign up. Before We Visit the Goddess tells the story of three generations of women in a family. The story moves from India to California to Texas. It moves back and forth in time and between the characters. Sabitri, lives in India and gets a devastating call from her daughter Bela. Bela's daughter Tara wants to quit college. Sabitri begins to write to her granddaughter, Tara, who she has never met, explaining why she should stay in college. So begins the tale of these three women. I don't recall when I added this one to my to-read list but I happened to see the audio and grabbed it. I enjoyed this tale of these women. I love hearing about Indian culture and when Indian food is also discussed, it's a bonus. Not only do you hear the stories of these three women, but for each woman, you hear from a male perspective in their lives. Through each of these stories, you learn more about each woman and what made them what they are and what gave them strength. Reading this book made me think that I really should read more of this author's books. I wanted to read this because of how much her book One Amazing Thing impressed me . This book in a way reminds me of it with its portrayal of the relationships , the connections between characters of different generations, even though they are very different stories . This is a short but meaningful novel of mothers and daughters ,of unexpected friendships , of cultural heritage . This is the story of Sabitri , Reading this book made me think that I really should read more of this author's books. I wanted to read this because of how much her book One Amazing Thing impressed me . This book in a way reminds me of it with its portrayal of the relationships , the connections between characters of different generations, even though they are very different stories . This is a short but meaningful novel of mothers and daughters ,of unexpected friendships , of cultural heritage . This is the story of Sabitri , Bela and Tara is told in different times in their lives , in different places and sometimes from the points of view of other people in their lives , and it is not told in chronological order . At first I though this shifting in time would bother me but it didn't because in each and every change we learn more about them. Sabitri traded away her dreams for a comfortable life after losing who she thought was the man she loved. Bela , her daughter, leaves her mother for America and a man she loves , and her daughter Tara struggles to find out who she is . Placing blame where it may not belong , mistakes and misjudgments of people along the way seemed to plague all of these women . Each of them living lives not exactly as they had hoped for at first , but yet discovering who the are by discovering things about each other and themselves. The Central theme is about an Indian family and three generations of women. It's written in different time lines. This novel 'almost' feels like several short stories are being told which are linked together - but mostly it felt like that to me because the overall story isn't told in chronological order. It kept me on my toes and curious as to how things would tie up at the end....yet in the end it felt like stories I've read before- or stories I've heard before from my Indian friends here in Si The Central theme is about an Indian family and three generations of women. It's written in different time lines. This novel 'almost' feels like several short stories are being told which are linked together - but mostly it felt like that to me because the overall story isn't told in chronological order. It kept me on my toes and curious as to how things would tie up at the end....yet in the end it felt like stories I've read before- or stories I've heard before from my Indian friends here in Silicon Valley. All the women want what they want! They don't like being controlled - nor does anyone particularly like doing the controlling.... yet they each can't seem to help themselves Part of the culture? Perhaps. Each of the women are stubborn and independent --- making for complicated relationships. Everyone is 'right' and seems to know what is best for everyone 'else'. Overall I thought this book was fair. The men in the book were weak......and the daughter of this story comes out looking like a spoiled brat ---but in defense of her she had a mother and a grandmother 'both' feeding her their words of advice... plus she suffered the most mistreatment. I would have felt smoother in this family.... and the expectations might have driven me to rebel too. ( just sayin). As with all stories about an Indian family - culture - heritage- there is mention of foods. This story is no different---although there is a higher emphasis on sweets. Fair - enjoyable enough -under 300 pages - but I felt it was missing something. This novel is made up of stories of the lives of three generations of women in one family. They are not organized chronologically, in fact one story starts from one decade and moves backwards in time. I really enjoyed the ways Divakaruni plays with time in that way, so you don't know whether to blame the mother or daughter for a conflict they are having. Some see this as an immigration story, as one of the women moves to the USA from India and raises her daughter there. And this occurs, for sure, This novel is made up of stories of the lives of three generations of women in one family. They are not organized chronologically, in fact one story starts from one decade and moves backwards in time. I really enjoyed the ways Divakaruni plays with time in that way, so you don't know whether to blame the mother or daughter for a conflict they are having. Some see this as an immigration story, as one of the women moves to the USA from India and raises her daughter there. And this occurs, for sure, but distance between women in a family is more of an excuse for why people aren't communicating, not the reason itself. I felt like the many ways the different women keep secrets, hide mistakes and real feelings, and try to find their paths felt true and could be true about many family groups. I think I'm trying to say that they felt universal. 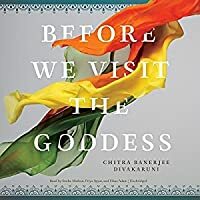 Chitra Banerjee Divakaruni, the best selling, award-winning author, has penned a terrific and heart rending grandmother-mother-daughter relationship drama in her new book, Before We Visit the Goddess that revolves around three woman bound together by blood yet separated by generation gaps. The author has narrated a longing tale of mistakes, misunderstandings spanning through three generations from Indian to USA reflecting how one mistake of one ambitious woman, who wanted to make a name for her family, cost her only daughter's choices that finally impacted her granddaughter's course of life. A beautiful powerful new novel from the bestselling award-winning author of Sister of My Heart and The Mistress of Spices about three generations of mothers and daughters who must discover their greatest source of strength in one another a masterful brilliant tale of a family both united and torn apart by ambition and love. The daughter of a poor baker in rural Bengal India Sabitri yearns to get an education but her family s situation means college is an impossible dream. Then an influential woman from Kolkata takes Sabitri under her wing but her generosity soon proves dangerous after the girl makes a single unforgivable misstep. Years later Sabitri's own daughter Bela haunted by her mother s choices flees abroad with her political refugee lover but the America she finds is vastly different from the country she d imagined. As the marriage crumbles and Bela is forced to forge her own path she unwittingly imprints her own child Tara with indelible lessons about freedom heartbreak and loyalty that will take a lifetime to unravel. In her latest novel Chitra Banerjee Divakaruni explores the complex relation-ships between mothers and daughters and the different kinds of love that bind us across generations. Before We Visit the Goddess captures the gorgeous complexity of these multi-generational and transcontinental bonds sweeping across the twentieth century from the countryside of Bengal India to the streets of Houston Texas an extraordinary journey told through a sparkling symphony of voices. Sabitri, a young, ambitious yet very poor woman wants to graduate but the financial condition of her sweets-making family speaks otherwise. Luckily, a benevolent yet haughty woman takes pity on such a dedicated young lady and provides her with the financial support to continue her education. But a silly misstep in her new life makes Sabitri pay for it heavily, eventually affecting her daughter, Bela's life, who escapes the wretched life in India along with her love of her life to USA, where the cultural barrier and the changes in her newly wedded husband depresses her and makes her regret her choice of not finishing education. That yet once again effects her daughter, Tara, who follows blindly into the footsteps of her careless mother. Helpless Bela can only seek advice from her mother whom she has never met after leaving USA, and through a letter, and some fragments of memories, the author has portrayed three woman's struggle to find their stand in the society through various socio-political barriers. The author's writing style is exquisite and eloquent and has laced the story line with so many deep, heart felt emotions that will move the readers for the characters' plight. The narrative is somewhat intellectual, thoughtful and truly authentic and it is told in various person narratives yet from the point of view of the three main characters, so that will let the readers contemplate with their honest voices. The pacing of the book is moderate yet flows calmly midst of deep philosophy about life and the weak bonds of a mother-daughter relationship. The author characterized the three central characters with honesty and depth that will help the readers to comprehend with the characters' hard choices. The demeanor of Sabitri is inspiring but gradually her mistake haunts her for the rest of her lives and even though she commits a silly error, yet her misery and regret for it would make the readers sympathize for her. Bela and Tara both are somehow crafted as reckless woman, who living in a foreign land, get out of touch from their original roots, yet somehow their plight and fall touch the readers' souls. There are some characters, like Bela's husband could have been developed with much depth, hence the last few chapters might sound very boring or meaningless for the readers. The author has vividly arrested the importance of blood relationship and how that strong bond of relationship weakened over the ages and near the end, the future of the relationship was hanging by a loose thread. This shifting dynamic is depicted with the raw edges of some painful sentiments that is bound to make the readers feel the sting of it, thus making the story extremely evocative. Although the backdrops aren't that well painted through this story and fails to evoke a sense of the location into the readers' hearts. In a nutshell, this captivating story is poignant, entertaining and filled with lots of emotions. Verdict: A satisfying and an enticing read! "Good daughters are fortunate lamps, brightening the family's name. Wicked daughters are firebrands, blackening the family name." This Indian proverb is repeated often in this story about three generations of mothers and daughters. All three women are hoping for love, a connection with their children, and a meaningful life. The book starts in the home of Sabitri in West Bengal, India. Her daughter, Bela, follows the man she loves to the United States and they have a rebellious daughter, Tara. Tar "Good daughters are fortunate lamps, brightening the family's name. Wicked daughters are firebrands, blackening the family name." This Indian proverb is repeated often in this story about three generations of mothers and daughters. All three women are hoping for love, a connection with their children, and a meaningful life. This one started as a 4-possibly-5-stars but gradually fell little by little. Ultimately I think the author and I just aren't quite a good fit for each other. I loved the first chapter and the story of Sabitri's life. I loved the concept behind the novel of finding what success means as a woman. But I always found that Divakaruni pushed one step too far. Characters I really enjoyed would do just ONE more thing and become someone I didn't like much anymore. There were just a few extra voices in t This one started as a 4-possibly-5-stars but gradually fell little by little. Ultimately I think the author and I just aren't quite a good fit for each other. I loved the first chapter and the story of Sabitri's life. I loved the concept behind the novel of finding what success means as a woman. But I always found that Divakaruni pushed one step too far. Characters I really enjoyed would do just ONE more thing and become someone I didn't like much anymore. There were just a few extra voices in the narrative that I didn't need or enjoy. There were moments I really loved, chapters I got lost in, but others that fell flat. I was disappointed in it, but never really connected with Bela or Tara the way I did with Sabitri. And for me, when I'm not really gelling with the characters it can be hard for me to connect with the whole book. A story of three generations of women, Sabitri, her daughter Bela, and her granddaughter Tara. The story moves back and forth in time and there are multiple PoVs, so you get a chance to find out how each woman is actually feeling about a particular incident/moment in her life. This was a pretty quick read, and not the first I've read by this author. I enjoyed this more than two other books I've read by this author, though I found the ending abrupt. There are books. There are journeys. There are books that are journeys. After a long time, I was invested in multiple characters from the same book and I felt I was a part of their journey from start to finish. I hadn’t felt that way for multiple characters in a book in a long time. There may be multiple reasons for the likability of all of these characters, each of which are from a different generation and still face the same form of troubles that the other generation faced. The book begins with There are books. There are journeys. There are books that are journeys. After a long time, I was invested in multiple characters from the same book and I felt I was a part of their journey from start to finish. I hadn’t felt that way for multiple characters in a book in a long time. There may be multiple reasons for the likability of all of these characters, each of which are from a different generation and still face the same form of troubles that the other generation faced. The book begins with a soft staggered introduction to the three characters that stay with you through the rest of the book: Sabitri, Bela and Tara. Having read Divakaruni’s Palace of Illusions in the past, I knew I was in for a decent read in terms of story-telling and the writing. While Palace of Illusions, which was based on Mahabharatha, did take significant creative license in the story telling, it was a book that made me look Divakaruni’s works up. Before We Visit The Goddess has the same type of strong characterisation and beautiful writing which makes you dwell into the book deeper and deeper. Sabitri, her daughter Bela and Bela’s daughter Tara are three women who have faced multiple occurrences in their life including separation of a loved one or a significant other, gotten back on track with their lives after their life goes haywire post the separation. The book does not insult the intelligence of the reader by tying a few obvious things in the narrative. It instead follows a very non-linear narrative with beautifully titled sections and goes on with the occurrences with one of the protagonists dedicated to that particular section. You have appearances of a few other characters who shape the lives of the three women and the story-telling is a so real that you realise the effect that the characters have had on the change in the lives of the protagonists only after a few chapters. As with life, change is shown gradually here and there are no overnight successes. This staying real is the book’s biggest strength and you see the same thing in the entire book. Of the three characters, you do find that the multi-layered nature of the characters is evident in all three characters Sabitri, Bela and Tara. However, the layering begins to reveal itself slowly and not all at once. This helps each of them maintain a slight mysterious nature and ensure that there is still something more that the characters have to offer into the premise through the book. Before We Visit The Goddess is a wonderfully written journey of three strong women and is sure to put a smile on your face with its likability and its ability to make you relate to the premise. 3.5 Three generations of women, mothers and daughters, relationships fraught with misunderstandings and conflicts. I think I understood Sabitri the most, identified with her and came to really admire all she accomplished. Her daughter Bela, I felt was very selfish, couldn't understand how she did what she did. Did warm up to her by the end of the book, but never really identified with her and hated the way she treated her mother. Tara, Belas daughter I was very conflicted about until the very en 3.5 Three generations of women, mothers and daughters, relationships fraught with misunderstandings and conflicts. I think I understood Sabitri the most, identified with her and came to really admire all she accomplished. Her daughter Bela, I felt was very selfish, couldn't understand how she did what she did. Did warm up to her by the end of the book, but never really identified with her and hated the way she treated her mother. Tara, Belas daughter I was very conflicted about until the very end. Still this is a well written book, an inside look at the struggles many mothers and daughters experience. Loved the ending and felt the characters had a large amount of depth. The skipping around in time periods worked and didn't, at times it was frustrating. Still, I enjoy this author and the stories she tells. Interesting and heartfelt. This was really good! I recommend this one to you all. Early last year, destiny showered me with a once in a lifetime opportunity. I had some work in Bangalore, and Chitra Banerjee Divakaruni, one of the favorite writers (I had loved her novel ‘Sister of My Heart’) was also coming to Bangalore to attend the Bangalore Times Lit Fest. I got a chance to attend her session, interact with her and Murthy, her husband, and even get a signed copy of her latest novel ‘Before We Visit The Goddess’. I will cherish it forever. Not everyday do you get to meet an Early last year, destiny showered me with a once in a lifetime opportunity. I had some work in Bangalore, and Chitra Banerjee Divakaruni, one of the favorite writers (I had loved her novel ‘Sister of My Heart’) was also coming to Bangalore to attend the Bangalore Times Lit Fest. I got a chance to attend her session, interact with her and Murthy, her husband, and even get a signed copy of her latest novel ‘Before We Visit The Goddess’. I will cherish it forever. Not everyday do you get to meet an internationally acclaimed, award-winning author. Since I had to finish my novel ‘The Fragile Thread of Hope’, get it published, and promote it, last year passed in the blink of an eye. A month ago, I finally got a chance to begin the book. After a few pages, as expected, I was hooked. I hadn’t thought that Chitra ma’am could improve upon her language, which was already delectably brilliant in ‘Sister of My Heart’, but I was amazed. Her language is even more refined in this book, her experience having poured layers of class over her already exquisite talent. I don’t remember how many times I re-read more than half of the sentences in the book to appreciate their poetic beauty and try to learn and imbibe some of her marvelous qualities in my writing. Just like Sachin Tendulkar, who used to delight cricket fans with his range of shots in all formats of the game, Chitra ma’am shows her repertoire by dabbling in almost every POV. Third person limited, first person, second person, she has implemented all with exquisite perfection. There is absolutely no head-hopping, an error which debut writers are almost always guilty of. The dialogues are impeccable and hard-hitting too, and I loved the strong, emotional encounters between the characters at several places. And obviously the editing is flawless—but that is expected from a Chitra Divakaruni book. The characters are beautifully developed, every scene adding layers over them, painting them with gray shades, garnishing them using snippets from the past. I felt for each of them and could relate to them. I did feel emotional many times too, but somehow—the same thing happened with ma’am’s previous book—the story didn’t push me enough to make me cry. However, that is just a minor flaw in a brilliantly written book. I loved it from beginning to end, and I’m sure the characters will stay with me for a long time. The ending is wonderfully done too except for one question that remains unanswered and which is nagging me, urging me to shoot a mail to ma’am and ask her. However, that is totally the author’s choice and I respect it. Finally, I would like to say that this book is a must-read for all, especially for new writers as there is so much to learn from Chitra ma’am.
" What is it about children? An old need twisted in Sabitri's chest. Protect, protect." A friend recently told me about an American colleague's reaction to her mother's six month long visit. "I can't believe you can live with your mother for six months!" was the colleague's comment. Obviously, my friend and I were as bewildered by this reaction as the colleague was by the (subjectively speaking) long stay. It led me to start thinking about cultural differences in parent-child interactions. Indian " What is it about children? An old need twisted in Sabitri's chest. Protect, protect." A friend recently told me about an American colleague's reaction to her mother's six month long visit. "I can't believe you can live with your mother for six months!" was the colleague's comment. Obviously, my friend and I were as bewildered by this reaction as the colleague was by the (subjectively speaking) long stay. It led me to start thinking about cultural differences in parent-child interactions. Indians, traditionally have much closer relationships with their parents. Not that these relationships are without conflict, but we learn to forgive and forget. The "dependence" that Americans perceive as existing in such a relationship is a actually a mutually beneficial support system. Things however are changing,and I couldn't help wondering if in second/third generation Indian-American families a loosening of bonds would be a natural development. It was then that I came across Chitra Banerjee Divakaruni's Before We Visit The Goddess. Stories about father-son or mother-daughter relationships are tricky. On the one hand, they can turn into a cliche --a rehash of conflicts and conversations that are déjà vu. On the other hand, when told with sensitivity and a willingness to see the characters as individuals that have lives beyond the relationship, such stories become something that the reader can identify with intimately without the feeling of :been there, done that." Sabitri, in late 1950's Kolkata dreams of an education but is constrained by her poverty. When a rich benefactor offers her an opportunity to study, she grabs at it, but loses it just as suddenly. Later, she works hard to give her daughter Bela every advantage to achieve something for herself. But Bela, in the grip of a young love, elopes to the United States with her lover who is a political refugee. Life and love however are unpredictable games, and Bela's disappointments become wounds to her daughter Tara. Tara, disillusioned, rebellious and out of touch with her roots, is more like her mother and grandmother than she realizes. Chitra Bennerjee Divakaruni treats these complex lives with the delicate touch of a master painter, creating images of each character that are vivid and brilliant. These three women are truly unforgettable, and startlingly recognizable. Within this landscape of parent-child relationships, we see glimpses of some other relationships, like that of the spunky Mrs Mehta with her son and daughter-in-law; of Dr Venkatachalapathi, whose close mindedness cost him his daughter; and that of Kenneth who rejected by his parents, finds a friend and mother figure in Bela. The novel however goes beyond just this exploration of relationships to an exploration of identities. The way in which a woman creates a space and an environment for herself to flourish in, the process of identity building, the experimentation with a sense of self versus a sense of tradition are are beautifully dealt with. The author plays with time in this novel, so that sometimes we see the consequences of an action or a decision before we know what the action/decision is. This inversion of cause and effect makes for a compelling story-telling technique. There are just enough gaps in the stories, just enough that is left untold, to keep the reader coming back to them long after the last page has been read. In this, the novel masquerades as a series of connected short stories. While this may be a turn-off for some readers, I personally found it captivating. As in most of Chitra Banerjee Divakaruni's novels, food has a place of honour in Before We Visit The Goddess as well. It is almost a living, breathing person, the way it exists in the lives of the characters, and it is impossible to read the book without craving desperately for an engorged roshogolla or a comforting mishti-doi. The best storytellers always keep you coming back. They have their unique signatures, a unique voice, that enchants the reader and draws them back to listen to one story, then the next and then the one after that. Chitra Banerjee Divakaruni is one such masterful storysmith. I am done with reading Before We Visit The Goddess for now, but I keep thinking about the characters, and I know that a re-reading is in store for the future. FTC disclaimer: I received a review copy of this book from the publisher for this honest review. This was yet another book challenge read. I haven't read this author before. Her writing was very neat and clean. The story, while it was definitely well structured, contained a lot of repetition. This story covered three generations of women (and then some) and contained a few different POVs. I think having all the different POVs was the biggest problem for me. It made this not only repetitive, but also jumpy. Overall, I liked this. The author described the relationship dynamics very well....the This was yet another book challenge read. I haven't read this author before. Her writing was very neat and clean. The story, while it was definitely well structured, contained a lot of repetition. This story covered three generations of women (and then some) and contained a few different POVs. I think having all the different POVs was the biggest problem for me. It made this not only repetitive, but also jumpy. Overall, I liked this. The author described the relationship dynamics very well....the love, the expectations, the disappointments, the hopes and the dreams were well done. So 3 stars. Chitra Banerjee Divakaruni has been one of my favorite authors for a while now. This is one of her best books. I was absorbed in the characters and their situations from the first page. I loved the structure of the book which did some skipping around, but not in a confusing way. Three generations of Indian women and the secrets they keep from each other make for a book that is difficult to put down, a book that will stay with me for a long time. Let me begin by saying this - I love this author. I love her writing and her online persona. So, I knew I was gonna like this book before I even started. The men in this book are all way too weak t Let me begin by saying this - I love this author. I love her writing and her online persona. So, I knew I was gonna like this book before I even started. The men in this book are all way too weak to my liking and they needn't have been this way and this is the only thing I quite didn't like in the plot. I started reading Chitra Banerjee Divakaruni’s books in about 2001. I clearly remember being fascinated then by the writing and surprisingly still am. Every time there is a book by her, I devour it. I am somehow taken in by the writing that is so lucid and the interpersonal relationships that stand out so strong in all her books. Whether she is speaking of Draupadi in “The Palace of Illusions” or trying to deal with cousins and their lives in “Sister of my Heart”, she sure knows her craft and is I started reading Chitra Banerjee Divakaruni’s books in about 2001. I clearly remember being fascinated then by the writing and surprisingly still am. Every time there is a book by her, I devour it. I am somehow taken in by the writing that is so lucid and the interpersonal relationships that stand out so strong in all her books. Whether she is speaking of Draupadi in “The Palace of Illusions” or trying to deal with cousins and their lives in “Sister of my Heart”, she sure knows her craft and is the top notch mistress of it. “Before we visit the Goddess” is her latest book and to be honest, I think it is way better than the others (that’s saying something) and very taut in its writing. It is a story of three generations of mothers and daughters – spanning right from West Bengal and leading to Texas – a sort of back and forth – not only between terrains but also emotions and lifestyles. The book is about a family that is torn apart by love, ambition, pride and the need to belong. It starts with Sabitri, daughter of a poor banker in rural Bengal and the decisions she makes that will rock not only her world but also those of her daughter Bela’s (even though she manages to escape to America, falsely thinking that the past is well behind her) and her granddaughter Tara’s who will learn and unlearn love the hard way. I think more than anything else it is the uniqueness (or not for some) of the plot that had me going. The voices are strong, fearful, uncertain and only human at the end of it all – as the story progresses and reaches an end which is quite unpredictable. The writing as usual is succinct and not too long. At no point did I feel that I did not know the characters or wanted the book to be longer. It is just right. The pace of the book is languid – the way it should be – the descriptions rich and in full detail, making you wait as a reader about what’s going to happen next. Chitra Banerjee Divakaruni is a master story teller that both inspires and intrigues. Never have I ever ... been so exasperated by a novel. I feel like I've started to read Chitra Banerjee Divakaruni's books out of habit, and out of hope that one of them will be as amazing as The Palace of Illusions, one of my all time favorite books. This latest one felt like half a novel -- extremely annoying, as it was good, and I would have loved to read the complete story. The story covers three generations of women (Savitri, Bela, and Tara) and the way their lives intersect, and affect each Never have I ever ... been so exasperated by a novel. However, the most frustrating thing of all was that I really, really wanted to read about these characters, but the story was over before I could really get into them. This novel could have been twice as long and I would have read it happily. I had so many questions, namely about Savitri's mother, Durga, and Bela's relationship to Sanjay. Also, what was Bela's life like after her encounter with the magician? It's sort of hinted at, but I wanted details. Also, I loved Mrs Mehta, the feisty, lonely Indian widow that Tara cares for. Why was she never mentioned again? If I were editing this book I would ask Ms. Divakaruni to write the novel again, and to please not rush this time. Also, this tiny nitpick keeps niggling at me: why were cell phones mentioned so many times in parts of the story that took place in 1998 to 2000? Granted, I was in high school then, and high school kids were not entitled to a phone the way they are now, but I feel like very few people had them then, and there was no such thing as voice mail. I can remember that my uncle had one because he was a doctor, but I don't recall being able to leave messages for him on the phone. There was absolutely no such thing as having only a cell phone in 1998 -- if you had a cell, you had a landline because cell phones were considered somewhat unnecessary luxury items. And one of the characters sends a text message in 2000, which I feel was very early to be texting. I remember beginning to text in 2003, because that's what my friends in California were starting to do, but it was so new and unusual that a lot of people didn't bother to respond; they just called me. It just strikes me as unreal that a character in Texas in 2000 has a cell phone, and that his older, undocumented immigrant neighbor, who has no money, also has a cell phone, and that this Texan character texts this older neighbor. As I write this I am even more aware of how ludicrous that sounds. Another example of the poor editing of this novel. This is the first book I have read by this author. Before we Visit the Goddess is a family story of three generations of Indian women, Sabithri, her daughter Bela and Bela's daughter Tara. Sabithri never left India, she had a successful store Durka's Sweets, named after her mother. Bela leaves for America following her lover, who becomes her husband. This family is by no means the happily ever after. Relationships, marriages don't always work out. The story is told from the 1950's to 2020 in no This is the first book I have read by this author. Before we Visit the Goddess is a family story of three generations of Indian women, Sabithri, her daughter Bela and Bela's daughter Tara. Sabithri never left India, she had a successful store Durka's Sweets, named after her mother. Bela leaves for America following her lover, who becomes her husband. This family is by no means the happily ever after. Relationships, marriages don't always work out. The story is told from the 1950's to 2020 in no chronological order always from someone else's point of view. Through the pages the reader finds out how much decisions made early in life will affect others, even future generations. I found the back and forth in time frames and different point of views a little disjointed, but it didn't take away from enjoying the novel. I wish I had known what some of the foods were that are described in the novel. I have no experience at all with Indian food. Maybe a glossary or explanation at the end might be helpful for others not familiar with Indian culture. I do recommend this book and will read other books by this author. I love the premise of this book & the characters are well developed but I felt that I needed more details. I felt like too much was left to my imagination. Too many years are skipped throughout the story & the transitioning between character's point of view was disjointed & jarring at times. Each character is multi layered & there is growth on the part of each by the end but I never really felt like I fully understood them or the relationships they had with each other. It felt ru I love the premise of this book & the characters are well developed but I felt that I needed more details. I felt like too much was left to my imagination. Too many years are skipped throughout the story & the transitioning between character's point of view was disjointed & jarring at times. Each character is multi layered & there is growth on the part of each by the end but I never really felt like I fully understood them or the relationships they had with each other. It felt rushed. The prose is beautifully written & the dialogue between characters is believable but it almost feels as if this book is a series of short stories dropped into a novel. I think it would work better in the format of a short story collection. I have no doubt that Divakaruni can write, this book just felt a bit unfinished for me. I'd like to read other books by this author because the writing is beautiful; I just wasn't a fan of the structure of this book. I have read couple of Divakaruni's previous books and found them all to be pretty entertaining. This book was multilayered and more grittier than her usual storylines. The story spans three generations and paints the lives of 3 women. Grandmother, mother, daughter. I liked the fact that the relationship the mother daughter shares in each generation was not picture perfect. It seemed more real. In each generation the mother does what she felt was right for her daughter only to be left heartbroken I have read couple of Divakaruni's previous books and found them all to be pretty entertaining. This book was multilayered and more grittier than her usual storylines. The story spans three generations and paints the lives of 3 women. Grandmother, mother, daughter. I liked the fact that the relationship the mother daughter shares in each generation was not picture perfect. It seemed more real. In each generation the mother does what she felt was right for her daughter only to be left heartbroken and alone. The 3 women battle with their mothers and their own personal demons, never quite realising that they have been the central most important thing in their mother's life. You know you loved reading a book when the first thoughts you have are about the book after waking up! A beautiful story of three generations, Sabitri, Bela and Tara. The story starts in rural Bengal and ends in Texas. Sabitri is a daughter of a poor sweet maker in Bengal, for whom education is a privilege. A rich woman from the village sponsors her education but one mistake makes everything go haywire. Bela, Sabitri's daughter elopes with her lover to the US. Hers is a story of immense whirlwinds You know you loved reading a book when the first thoughts you have are about the book after waking up! Bela, Sabitri's daughter elopes with her lover to the US. Hers is a story of immense whirlwinds. Tara, Bela's daughter is born and raised in the US. Tara will learn about life and love in the hard way. I loved how dysfunctional Tara's character was. A confused first generation immigrant in the US, her story is told very effortlessly and we could connect with her easily. You cannot help but love the three women in the book. I loved Sabitri's character the most because of her strong willed nature. A beautiful story highlighting a mother daughter relationship. The book feels like reading many short stories within the main story. I loved the writing and the way of story telling. I admit it started off as mediocre for me, but I am glad I kept reading. The story became more intense as it progressed and it was hard to put this book down. What I loved most about it that how brilliantly the story was told through various POV's. I love Chitra Banerjee Divakaruni's works and this one made me fall head over heels with her books once again. Three generations of Indian women woven into a deep tale, Before We Visit The Goddess is a story that highlights the unseen side of relationships between mothers and their daughters. Chitra B Divakaruni has been known for her deep stories which revolve around a small community, bounded by traditions and love, surpassing all boundaries. Before We Visit The Goddess is a novel spanning 60 years, opening with Sabitri who recently got to know that her American-born granddaughter, Tara, is planning to Three generations of Indian women woven into a deep tale, Before We Visit The Goddess is a story that highlights the unseen side of relationships between mothers and their daughters. Chitra B Divakaruni has been known for her deep stories which revolve around a small community, bounded by traditions and love, surpassing all boundaries. Before We Visit The Goddess is a novel spanning 60 years, opening with Sabitri who recently got to know that her American-born granddaughter, Tara, is planning to drop out of college. Sabitri has never met Tara and is longing to met her own daughter, Bela for many years. She decides to write a letter to Tara to make her understand how education helped her when no one was there. She starts chronicling her life starting from the point where she used to help her mother out to make sweets for rich families of the village. She was taken up by rich sponsors, but soon falls out of the arrangement when she fell in love with their son. Discarded from the community, she turned her fate around and got married to her professor, who settled down for a lavish job and that's when they had Bela. After her husband's death, Sabitri takes up the charge of her life and Bela by opening a sweet shop, Durga Sweets. After decades, Bela repeats the history again. She drops out of college and elopes with her boyfriend, Sanjay to the USA. She never returns to India or sees her mother. But the new country doesn't treat Bela the way she expected. She deals with alienation and disconnect from her culture and family, which she passes on to Tara as well. Before We Visit The Goddess explores the moments that echo across generations as well as the quiet erosion of culture that happens over time. Chitra B Divakaruni has a flair of sharing deep stories with us, something which we don't ponder on. Her stories always stand out in this way. In Before We Visit The Goddess, you witness the complications of the mother-daughter relationship. A mother who is trying to save coming generations from the mistakes she made, but is unable to from time to time. The frustration and sadness at her inability make her drown in deep sorrow. It is something that we relate to in Indian culture as well. When our parents become too cautious and start sharing their experiences, saving us from the paths that can lead to a dark future. Especially our mothers, who understand the role of women in our society and try and prepare us as much as she can, so that nobody can take advantage of us or let us down. Our mothers prepare us to prove that we really are fortunate lamps. Before We Visit The Goddess is a story that you will really like. The story line is pretty smooth and easy to comprehend from heart. It is a story of deeply affecting moments. The only issue I faced with Before We Visit The Goddess was that a story that opened on such a great note, left some loose ends at the climax. The climax took away the essence of the story and rather focused on minor characters, like Bela's neighbor. This story is told from three different perspectives, those of Grandmother, Mom, and Daughter. I thought Grandmother’s story was the most interesting, unfolding slowly as she wrote a letter to her granddaughter, imploring her to stay in school. Mom’s story was ok, about growing up with distant parents and being the pawn of an overactive imagination or an old magician or maybe both. She's the bridge between her own mother and her daughter and she's failed in that role. Daughter’s story is contemporary and American. Her reader isn’t all that great. I felt hers was the weakest tale but that's not to say it wasn't good. It just wasn't the best of the three. They’re all looking for men who love them. Grandmother, Sabatri, found one but her daughter ruined that, making it seem like maybe the man never loved them, after all. Mom, Bayla, missing her father and angry at her mother’s distance, followed her guy to America and it didn’t work out well. She wound up divorced. Daughter, Tara, is American and misses her dad so eschews Indian culture altogether. She can’t find a boyfriend who treats her well. There's a theme here. Grandmother gets out of trouble by creating and running her sweet shop, Durga’s Sweets. Bayla will get out of trouble by starting Bayla’s Kitchen. Tara will figure out how to get out of trouble and it will probably involve food because there's a theme here. It's a lovely maternal lineage story, moving from an older culture in India to contemporary American society, and it wraps up beautifully with the final lines of Sabatri's letter to Tara. 3.5 stars. I would like to write my thoughts but these days other things demand my time and attention so much I need a nap! Loved reading it especially about the first 90+ pages. After that I felt that Chitra Banerjee Divakaruni was purposefully trying to include lots of contemporary situations and it felt (to me) a bit less fluid and artful. Still, she is a great novelist so its still a good read. I could relate to it. The generations that survived on frugality, the sacrifices of our previous generations, each generation giving a little less than its previous one, Social structures evolving… For instance, how do you define a scandal? – A servant girl hoping to marry her employer’s son, a widow’s daughter eloping to marry a boy from a different community, a much-loved daughter brought up in the US living in with several men before finding one she can trust, themes of homosexuality…? Each g I could relate to it. The generations that survived on frugality, the sacrifices of our previous generations, each generation giving a little less than its previous one, Social structures evolving… For instance, how do you define a scandal? – A servant girl hoping to marry her employer’s son, a widow’s daughter eloping to marry a boy from a different community, a much-loved daughter brought up in the US living in with several men before finding one she can trust, themes of homosexuality…? Each generation being more liberal than what is perceived / expected of them. We often surprise ourselves with how tolerant we can be if we tried, how much more we can persevere before we give in. This is not a story of the Crossover genre – Indians are Indians in this book, it isn’t a comparison or metamorphosis of lifestyle in any way. However the story is very universal in appeal. I came across this book in bookstores and passed it up thinking of the thousands of similar Indo-American writers / novels that run the same theme. But recently I found a review of this title on the reading list of an American blogger’s book club. So yes there must be something more compelling about it. After reading this, I can imagine why (aside from tireless publicity campaigns) a book club / blog in the United States would be reading it, recommending it and be highly inspired by it. The core plot revolves around the mother-daughter equation throughout generations. Till the very end, there are things left unsaid because that is how we are – there is always time to address so-and-so thing later. Why today? Why right away? The men in the book have a crucial impact on the women’s lives – they are the heads of families, of organizations, of all decision-making and are indispensible just as in reality – no matter how tormented their relationships with their women – no matter how emancipated the times become. The book is not a comparison or debate on genders either. It is simply a story of generations of longing, how dealing with what you want and what you must do has been changing itself slowly. Not much has changed; at the same time there has been a world of difference made to humankind. There are lessons to be learnt from these stories. Having said that the writer’s style is easy to receive, never pedantic, highly evocative of personal memories even while it isn’t too verbose. The characters take turns narrating the story. It does not read chronologically but it’s easy to follow. There are no complicated nuances you need to keep track of – just a simple, enjoyable story. Every character is so human with all their flaws. Just when you write off a character, they end up narrating the next part and thus redeem themselves. 1. The stress of each mother to have her daughter educated (a notch higher than she herself is), not for the sake of knowledge itself but for becoming the ultimate means to sustaining herself (and her daughter in turn). Divakaruni calls it becoming a “fortunate lamp”. 2. The skills we inadvertently learn from our mothers – culinary, personality, life-preserving. A lot of it is unconscious and we don’t know we are doing it often. 4. The female instinct for survival; how when danger is upon you, you know exactly what sacrifices to make, what games to play. 5. Towards the end when Tara finds a letter from her grandmother, she realizes she knows so little about the old lady and her story. It made me think of how little I know of the actual day-to-day thoughts that ran through my grandmother’s mind. What she presented to others and what she felt must have been so different. I wonder if she ever dared to speak her mind. In summary there is one quote that comes to mind that aptly describes the struggle in this beautiful story – “All women become like their mothers. That is their tragedy. No man does. That’s his.” ~ Oscar Wilde. Chitra Banerjee Divakaruni is an award-winning author and poet. Her themes include the Indian experience, contemporary America, women, immigration, history, myth, and the joys and challenges of living in a multicultural world. Her work is widely known, as she has been published in over 50 magazines, including the Atlantic Monthly and The New Yorker, and her writing has been included in over 50 ant Chitra Banerjee Divakaruni is an award-winning author and poet. Her themes include the Indian experience, contemporary America, women, immigration, history, myth, and the joys and challenges of living in a multicultural world. Her work is widely known, as she has been published in over 50 magazines, including the Atlantic Monthly and The New Yorker, and her writing has been included in over 50 anthologies. Her works have been translated into 29 languages, including Dutch, Hebrew, Hindi and Japanese. Divakaruni also writes for children and young adults.Her novels One Amazing Thing, Oleander Girl, Sister of My Heart and Palace of Illusions are currently in the process of being made into movies. http://www.chitradivakaruni.com/books.... Her newest novel is Before We Visit the Goddess (about 3 generations of women-- grandmother, mother and daughter-- who each examine the question "what does it mean to be a successful woman.") Simon & Schuster.